Bake cake mix as directed. Mix pudding with milk. Break up 1/2 of the cake in pieces and line the bottom of a trifle glass bowl. 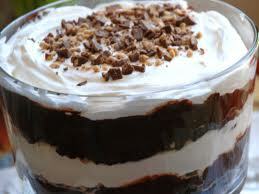 Pour 1/2 of the Kahlua over cake layer with pudding and 8 oz. of Cool Whip. Repeat to create a second layer. Refrigerate.